The Lensbaby Composer is not like any other lens you have ever used. In a good way. It is a creatively-designed product that inspires creativity. While I did not write the Lensbaby off as a fad, it did take Sam a couple of years to convince me that a Lensbaby review was worth my time. 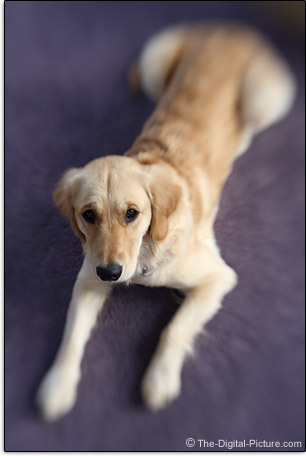 When I saw the new (as of this review) Lensbaby Composer, I asked Sam to send me an evaluation sample. And the review was definitely worth my time. As Sam indicates, the Composer provides a unique way to control depth of field. Let's take a look at an example. 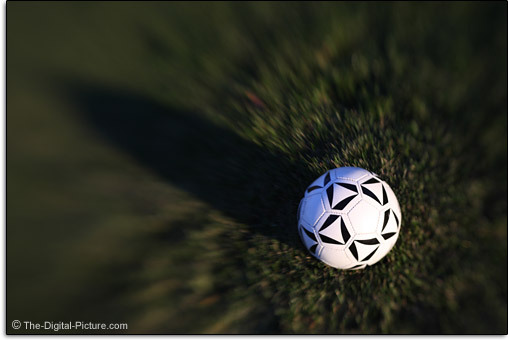 The soccer ball is sharp, the grass is blurred. A normal lens could blur the background and foreground, but not the areas in the same plane of sharp focus as the ball. And only expensive, very wide aperture lenses could create this much blur. 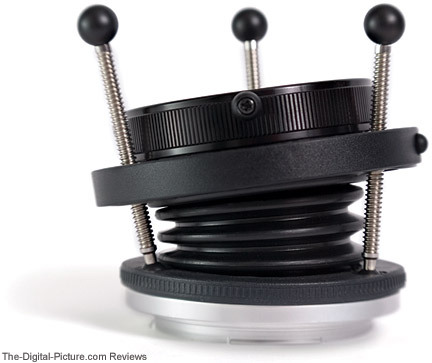 The Lensbaby Composer is basically a ball and socket with a lens set installed in the front (ball) portion of the assembly. To move the sharp-focused area around in the frame, the lens elements are pivoted on the ball. Friction on the ball is controlled by the rear black-ribbed ring that fine-click-stops into place. Set it loose (still holds the lens in place but is easy to adjust) or lock it tight. The plastic ball is not as precise as a high quality tripod ball head, but the lens is far lighter (and is less expensive) than these. The ball works fine for its purpose. Mouseover the labels above to see the lens in various positions. As usual, manual focusing is done by turning the manual focus ring (this is a manual focus-only lens). Focus is achieved by moving the entire lens assembly forward for close focusing and back for distant focusing. Constructed of plastic and aluminum, the Composer is small and extremely light. The Lensbaby Composer is not like other lenses, but this small chart should put the size and weight into perspective. The Composer tested to be very similar to the Canon 50mm lenses listed above for focal length - matching the spec. The 130g weight does not include caps or any aperture disks (all of these weigh only 15g in the case - I'll describe them later) but includes the Double Glass Optic. 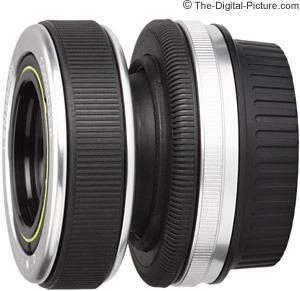 The filter spec is listed at a tiny 37mm - and the little center-pinch 37mm lens cap is cute. There are no electronics and only a few moving parts in the Composer. This means that not only are apertures manually controlled and not reported to the camera (not present in EXIF data), they are physically installed. The Lensbaby Composer ships with the Magnetic Aperture Set including the magnetic wand aperture removal tool and custom storage case shown above. The included aperture discs allow apertures of f/2 (no aperture disk installed), 2.8, 4, 5.6, 8, 11, 16, and 22. Not shown is the 35mm film canister cap that secures the aperture discs into the case (Sam thinks that Lensbaby LLC is currently the #1 buyer for these caps). Select the aperture you want and drop it into the Composer. The slightly flexible metalicized plastic aperture disks are secured by three magnets inside the lens optic being used (excluding the Pin Hole Optic). Use the magnetic wand tool to remove the aperture disk when changing apertures. The system is simple to use, but of course there are now loose parts to lose. Fortunately, replacements are inexpensive. Manually installed aperture disks allow additional control of the image. The shape of the aperture hole can be manipulated for creative control over the shape of the spherical highlights in your Lensbaby photos. The very inexpensive Lensbaby Creative Aperture Kit provides an f/4 star shaped aperture disk, an f/4 heart shaped disk and 5 blank disks. "By using these disks, points of light in out-of-focus areas of the photo take on the same shape as the center opening of the aperture disk. For instance, with the star aperture, points of light behind the subject appear as glowing stars." The blank disks are used for creating custom shapes by using a shaped paper punch (sold at craft stores) or a sharp knife. These creative aperture disks can be rotated to rotate the effect. Very cool. Since the lens aperture is fixed, the viewfinder is dark when narrow apertures are selected (normal lens apertures remain wide open until the shot is taken). DOF preview is always provided. Auto exposure in Av Mode functions normally. In the short period of time we had to meet, Sam seemed just as positive to be around as he sounds when writing about his creative lenses. And his replaceable optic concept is a great one. The Lensbaby Composer comes with the Double Optic lens - my personal favorite (I'm still hanging on to that sharpness issue I guess). 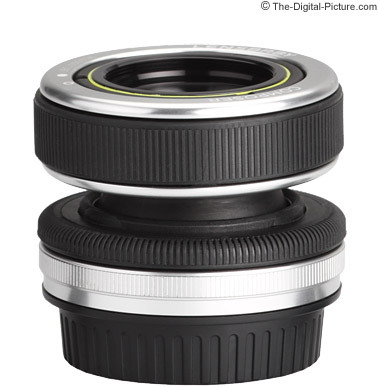 Each of the other Optics can be purchased individually or together in the Lensbaby Optic Kit. 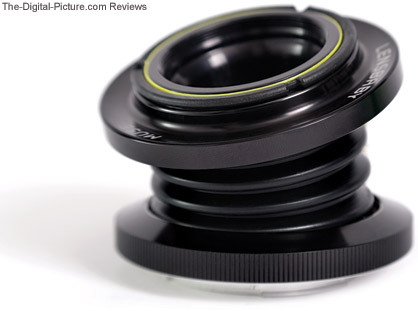 So, for an incremental cost, your Lensbaby can change its capabilities. Additional options can easily be added to the line and current Lensbaby model owners would be able to simply add the new Optics to their lens to gain the new capabilities. Let's take a look at the results from the currently available options. Use the mouseover labels below to see the reduced-but-full-frame results from the specified Optic and aperture combination. Dragging your mouse over the labels above will show the blur effect delivered by the corresponding lens optic and aperture selected. A stationary Canon EOS-1Ds Mark III was used for these not-perfectly-framed samples. Framing was done with the Double Glass Optic focused in the center of the test chart. The position was not changed for the rest of the sample shots. These are not pretty pictures, but they do give you an idea of the effect each combination produces. Keep in mind that when used on a 1.6x FOVCF body, the most-blurred area of the frame - the edges - will not be included. At f/2, the Double Glass Optic is soft in the center, but becomes reasonably sharp (sharper than I expected) when stopped down to f/2.8 and beyond. Corners remain extremely soft at all apertures - by design. As Sam indicated, the other Optics have increasing amounts of softness as you go down the list. Vignetting is very well controlled, but flare is not (not a surprise). Use the flare for its additional creativity. If there is any CA (Chromatic Aberration), I can't find it. And of course, the background blur quality is expectedly great. 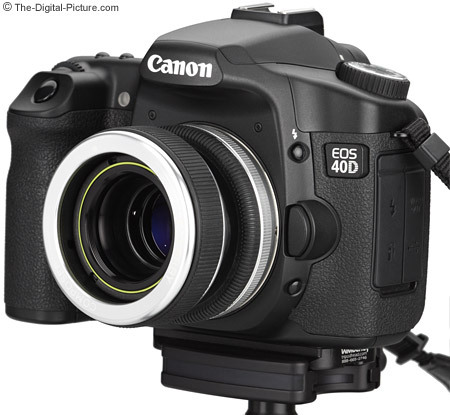 The Lensbaby Composer is shown mounted on a Canon EOS 40D in the above picture. The Composer is easy to use - it is one of those lenses that you can take out and get some decent shots with right away. Probably better results than photographers used to get with Vaseline smeared on filters in attempt to achieve this same look. But with use, your captures will become more and more impressive - as will your level of creativity. You will learn how to better use the lens and you will learn what images work best with the available lens and aperture combinations. Learning how to position the area of sharpness and match it with manual focusing takes some practice to become skilled at. I struggled a bit with a full frame body at f/2, but did better with f/2.8 and f/4 aperture disks installed. An easier time with focusing accuracy will be had when using a 1.6x body. A Lensbaby can be used in a very wide range of applications, but wedding photographers seem to be high on the list of those desiring the Lensbaby look. There's something romantic about the results. 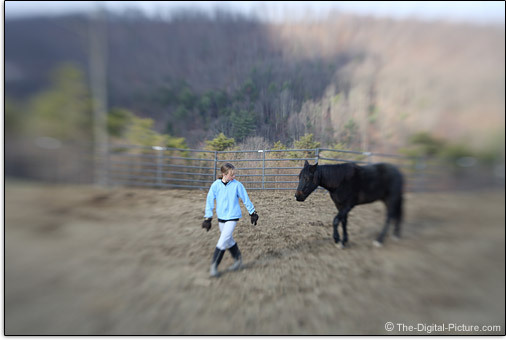 There are currently three Lensbaby models available (or coming soon). All take the same Optics (and therefore deliver the same image quality) and use the same aperture disks. While the Composer, my preference, is deemed "Smooth and precise", the Control Freak (below) is termed "Methodical and Step-by-Step" and the Muse (second below) is "Fast and Loose". "The Control Freak is the evolution of the Lensbaby 3G, an ideal selective focus lens for tabletop and macro photography. You can compress and bend the lens to find your desired Sweet Spot, and then lock it in place with the push of a button. Once locked, you can fine focus using the barrel focusing ring and fine tune the tilt with the Control Freak’s three metal posts." The Control Freak is priced similar to the composer (note: not available until Q2 2009). The Muse is the least expensive of the current Lensbaby lenses, but delivers the same image quality. "Photographers focus the Muse by compressing the lens and move the sweet spot by bending the flexible lens tubing." Lensbaby lenses are available in mounts for Canon EF (EOS), Nikon F, Sony Alpha A / Minolta Maxxum, Pentax K / Samsung GX and Olympus E1 / Panasonic Lumix DMC. For the most part, there is no worry about compatibility since there is no communication between the camera body and the lens. Automatic light metering is possible by shooting in aperture priority mode for almost all digital and film SLR camera bodies except certain Nikon bodies including the D40, D50, D60, D70, D70S, D80, D90, D100, N50, N65, N70, N75, N80, & Fuji S1, S2, and S3. Corner to corner sharpness is not always the goal for a lens - and in this case, corner softness is the goal. Creativity is what the Lensbaby Composer inspires. And for the low price, it makes a great gift for the photographer you want to inspire.